If you are up for a dark and Gothic themed game that will trigger the fear in you and make you want to turn the lights up, then Microgaming has the right game for you. Meet Immortal Romance Slot, a game we advise you to play when the sun goes down to experience game at its finest. Unlike many of the online video slot games that have a repeating theme and are over the top with similar stories, symbols and features, there aren’t many dark, vampire-related games, and Immortal Romance slot is one of the best, if not the most played dark-themed video slot game on the market. Because of this, we strongly suggest you spin the reels of this game, and believe us, you will love it. You can check it out on our site and claim the bonuses that we offer, together with the fantastic gameplay that the game itself can give you. There is a fine line that separates the horror and dark ambient that some people enjoy, and what is being offered in this slot game, and it is up to you to see it. Microgaming always tends to put great graphics in its games, and Immortal Romance is proof that this is true. You are going to love the small details all around the screen – the gargoyle sculptures sitting on the top of the reels and the specifics on the symbols themselves will get that morbid feeling triggered inside you. At the sides, you will notice that there aren’t any paylines numbers, which is a usual thing with all the slots. Instead, there is a 243 ways stating the number of paylines which this spot has. If you take a look at the bottom, you will see the adjustable options which this slot can offer, and they are the coins, coin value and bet per line. Also, we can find the Bet Max, Auto Play and the Spin at the bottom of the screen. Let’s not talk about the music as it plays a big part of the game, and always put the volume all the way up – believe us, you will have a fantastic playing time. 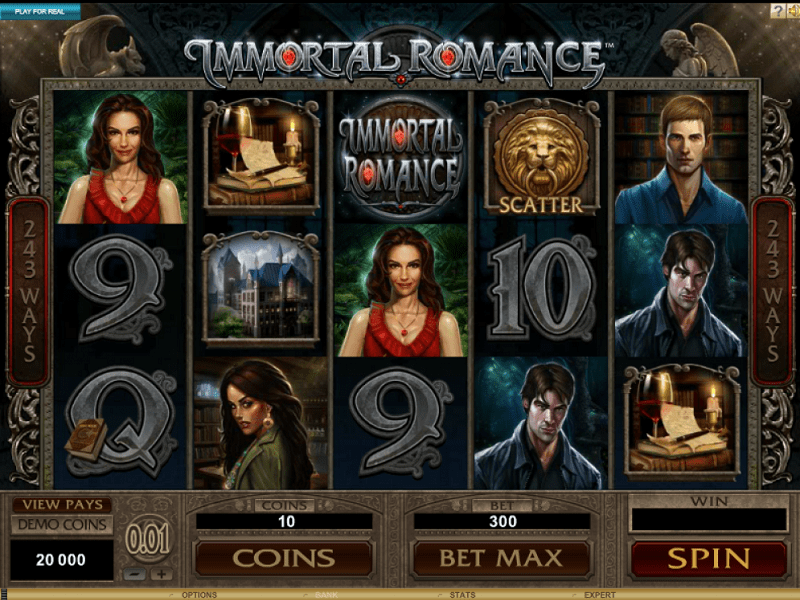 Let’s take a look at how the gameplay of Immortal Romance slot is, and how you can win some of their lucrative rewards. Like almost every online video slot game out on the market, in order to win a reward, you need to land a combination of three or more symbols in a line. When it comes to the symbols of Immortal Romance, we can see two categories of them. The lower valued ones, as expected, are the deck of cards inspired symbols which include 9, 10, Jack, Queen, King and the Ace. As we mentioned previously, they have a lovely touch of horror and gothic in their design, and they are made out of stone. The symbols that pay the most out of these is the Ace, while the number 9 will give you a slight boost, just to keep you in the slot for few spins. On the other hand, the higher valued symbols are where things get interesting. Here, we can see the game’s original characters as symbols including Sarah, Amber, Michael, and Troy. As an addition, there is an Old House and a Letter as higher valued symbols. To make things interesting, Microgaming decided to add special symbols in the slot which will help you get to the most lucrative wins of the game. The Wild symbol of this game is the Immortal Romance’s logo, and it is used as a substitute for the normal symbols of the game. What is great about this symbol is that it also pays out an astonishing 15,000x the stake if five Wild symbols land on an active payline. The Scatter symbol is the Lion’s Head Door Knocker. This symbol is used to activate the bonus features of the game. Immortal Romance is five reels and an amazing 243 paylines video slot game by Microgaming that aims to keep you intimidated and give you fantastic prizes as rewards for your durability. Manage to land three or more in the same line to trigger the spirits onto your side and give you some lovely gifts. To start playing the game, you will need to choose one of the casinos which are located on the side of this review. Choosing a casino is pretty important when playing a slot game, as it can boost your intentions, pave your way to the most lucrative wins of Immortal Romance Slot, and enhance your gameplay. It offers unique welcome bonuses, and you will be spending a lot of time on their pages, so we suggest you choose wisely. If you have a problem selecting a casino, pick the top one, as we always put the best casino on the top of the list. Once that’s done, it’s time to set the denomination of the slot. It can be played with a range of £0.30 all the way up to £300.00 with a minimum coin value of £0.01. As one of the best game producers in the world, Microgaming always tends to put as many options as possible for the players to choose from. We can see Demo Coins, which is a recent thing – it allows you to check the game out with demo coins before playing with real money. The Coin Variation is here, and you can set it from 1 to 10 coins per spin. There is no option to choose the desired number of paylines to play with, as you will always play with the maximum amount. 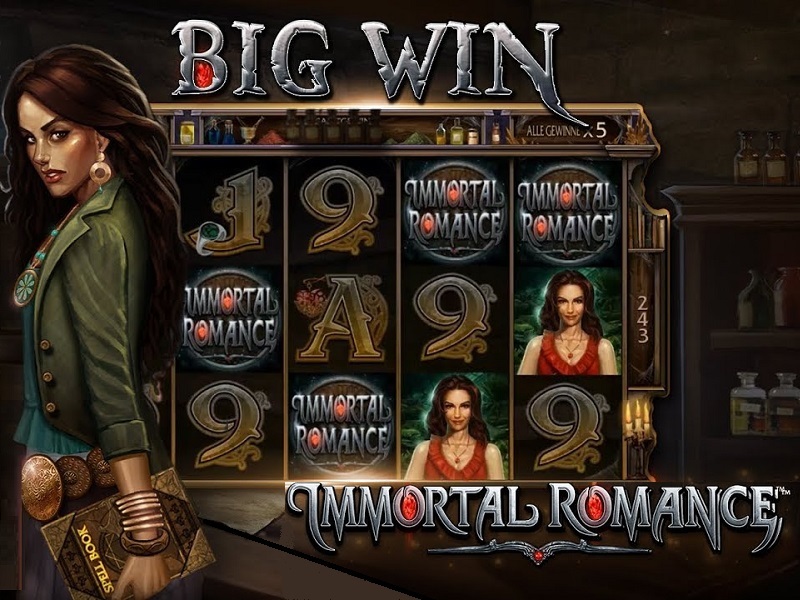 Since the maximum win that you can get in Immortal Romance slot is a multiplier, it is always better to play with as high denomination as your budget allows. This is when the Max Bet comes, as it is one of the most exciting options in the slot games, but also one of the most dangerous ones. Max Bet is for the ones that won’t get touched by the dark theme and the scary music, and still, wish to go all the way to the end and see 100% out of the game. It will set the denomination, coin value, and level of the game all the way to the maximum. In other slots, it also activates all the paylines, but since in Immortal Romance slot you can’t adjust the paylines, it can’t do that. This feature is one of the best when it comes to grabbing some of the most lucrative wins, but be careful, as you are spinning the reels with the highest denomination, it can lose all of your wagered money pretty fast. We suggest you come up with a plan or a limit to your cash, or completely neglect the feature. On the other hand, the Auto Play offers a much more relaxed time, and it will spin the reels of the game automatically. All you need to do is set the denomination and number of auto spins that you want the game to spin for you, and you are ready to go AFK and make yourself a cup of tea while the game fills in your stake with lucrative wins. Immortal Romance has a progressive bonus feature, which is one of the more interesting things in the slots gaming world. This game is activated if you land three or more Lion Door Knocker Scatter symbols on an active payline. There are four different levels with four different rewards, and you need to advance through and complete the 1st level to get access to the 2nd, and so on. With each next level, the number of free spins is increasing and the bonuses that you are receiving are getting better and better. At the final, fourth stage, you can trigger the massive jackpot which is 3,645,000 coins. 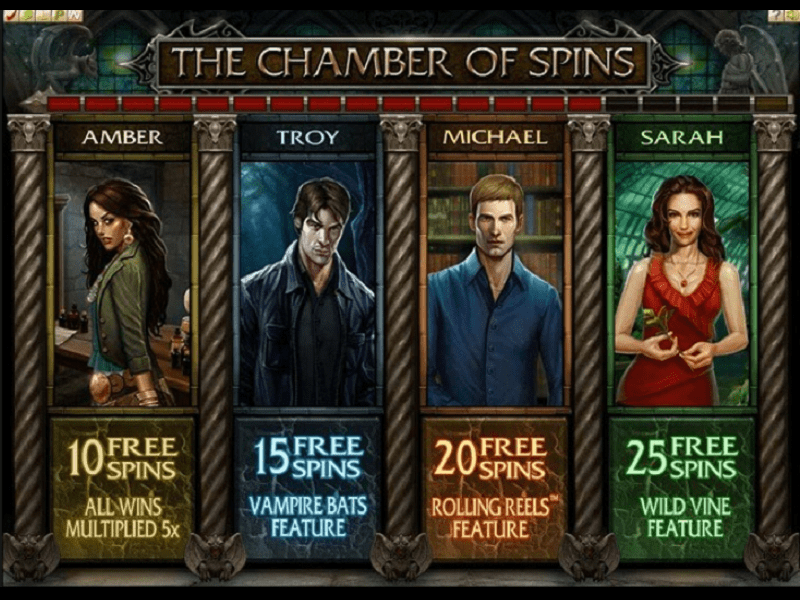 Sarah – 25 Free Spins – There is a possibility that Wild Vine can land on the third reel. This will transform the symbols into Scatters, and give additional spins. 2, 3, 4 or 5 symbols will award 1, 2, 3 or 4 more spins. The RTP or Return to Player is a pretty important number in every slot game. It indicates the amount of money, in percentage, that the slot gives back to the players that are playing that slot. If you want to find out more about RTP, check our Detailed RTP Guide. This is by almost 2% more than the average online slot RTP, and it is more than acceptable RTP in the slot you want to be playing. We just added one more reason for you to love this game! We all know how fast the technology is moving, and why it is important for all the games to be playable on a mobile device. We are living in an age where some people barely have time to sit and eat properly, and I don’t even want to talk about playing slot games on their computer. They want to spin the reels of Immortal Romance slot on Mobile, therefore Microgaming made that possible. You can play Immortal Romance Slot on Mobile regardless of which operating system you have (Android, iOS or Windows), or you can go with the old-school versions and spin them on your desktop, laptop and tablet. There is something catchy in Immortal Romance, and we know exactly what it is. It has a solid 69.86% Return to Player percentage and this is because of several things – The outstanding graphics, which can be noticed throughout the game, around the background and in the symbols themselves. The small details are doing its work, supported by the amazing, spooky sound in the background that rounds up the visuals of the game. The gameplay is on a high level, as the positive feedback from the happy player’s state. But all of this comes down if the prize that the game pays is not satisfying, which is not the case with this Microgaming video slot game. There is plenty for the players to enjoy and fill their pockets with, and together with the interesting and unordinary bonus rounds, it makes the perfect dark, gothic-themed video slot game.